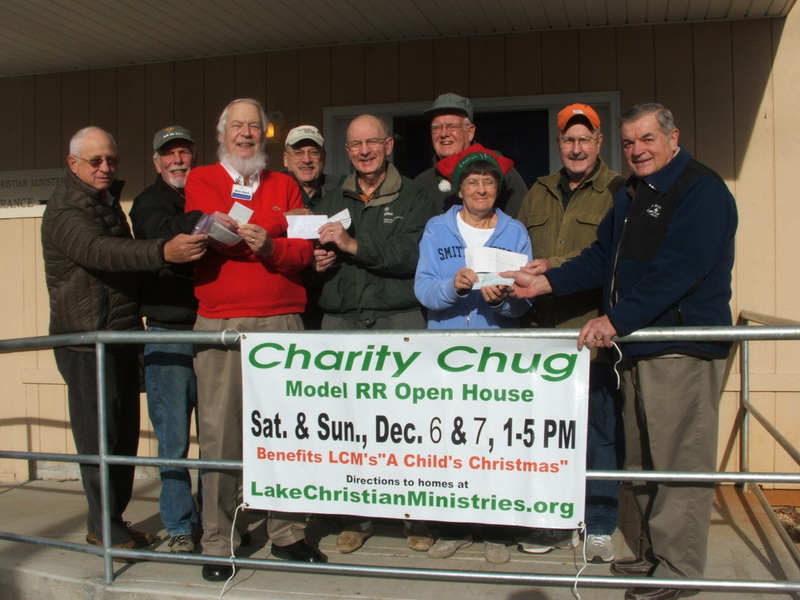 Seventh Annual SML Charity Chug model railroad layout hosts and event organizers present checks representing the donations collected at each of eight homes where exceptional train layouts were open for public viewing on December 6 & 7. Participating in the presentation of proceeds are (l to r): Ken Salley, Bob Longman, Lake Christian Ministries Executive Director Mike Bond, Bob Ford, Dave Phelps, Jim Mathie, Jim Caskie and Steve Holic. Missing from the photo are organizer Jerry Hale and layout hosts Herbert Cosby and Tom Huhn. Lynda Imirie (foreground) has coordinated LCM’s “A Child’s Christmas” project since it’s inception in 1996, when just 51 area children benefited. This year 555 children, newborn to age 16, from 255 families were served by the project, for which the Charity Chug raised its highest-ever total of over $4400.